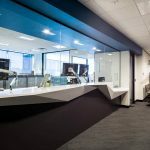 The IA Design team were appointed to facilitate the design, documentation and construction management of the new chambers at the Federal Circuit Court of Australia (FCCA). The Court was established to provide a simple and accessible alternative to litigation in the Federal Court of Australia and the Family Court of Australia. Upon engagement, the IA Design team undertook an extensive briefing process with the two judges to determine key priorities for each judge: space optimisation, acoustical design and security considerations. These priorities were fully integrated into the redesign of the William Street Courts, which included working environment with chambers, utilities, offices, a fully functioning commercial kitchen and function area. 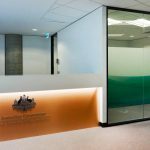 The chambers and hearing rooms were designed to meet the FCCA security and safety protocols with special consideration given to internal circulation and acoustical design. The function area was a prominent feature area of the new Courts, adjoined to one of the court rooms and opening out onto an outdoor area to take advantage of the Sydney city skyline. The end result is a modest yet sophisticated environment with improved amenities for staff and public traffic. The new Courts are compliant with DDA and Commonwealth security requisites.